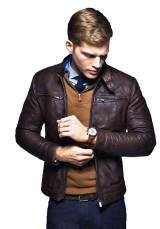 Delivery of the jacket will be usually in 7-9 working days from the date of your order confirmation. If the courier is unable to locate your shipment and give you an expected delivery date, the delivery guarantee will come into effect. Our warehouses are located overseas. Express shipment DHL and FedEx are employed for shipping all orders. The entire shipping process is traceable; hence, the customers can get their parcels right at their doorstep as per their convenience and without any hassles. In case you are not available to receive your shipment, you can certainly leave a note on the door directing delivery to a neighbor, who can sign for the package on your behalf. Express courier will leave a note with shipment number and a contact number, If no one can sign for the delivery on your behalf. We do not make delivery at Post office box. When you first place your order, you will receive notice, acknowledging the receipt of your order thereby sending you a copy of your detailed invoice. Your order is not registered, In case you do not receive any notice. Hence, it cannot be processed and shipped. You will get your amount back immediately equal to the amount of your purchase or a replacement shipment will be sent to you, If, for any reason, your order fails to arrive or it is unable to locate your shipment. If you intimate us by email about the delivery that is taking longer than the shipping notice estimate, we will get back to you with the courier’s tracking number for the shipment and directions for using this number to learn the status of your shipment. Note: Delivery is usually done in less time than 4-5 working days. Contact within 7 days of your shipment arrival, if there is any damage found in the product.